A RBTH correspondent in St. Petersburg talks to a Chinese student who is coming to terms with the Russian language and the city’s cold weather. 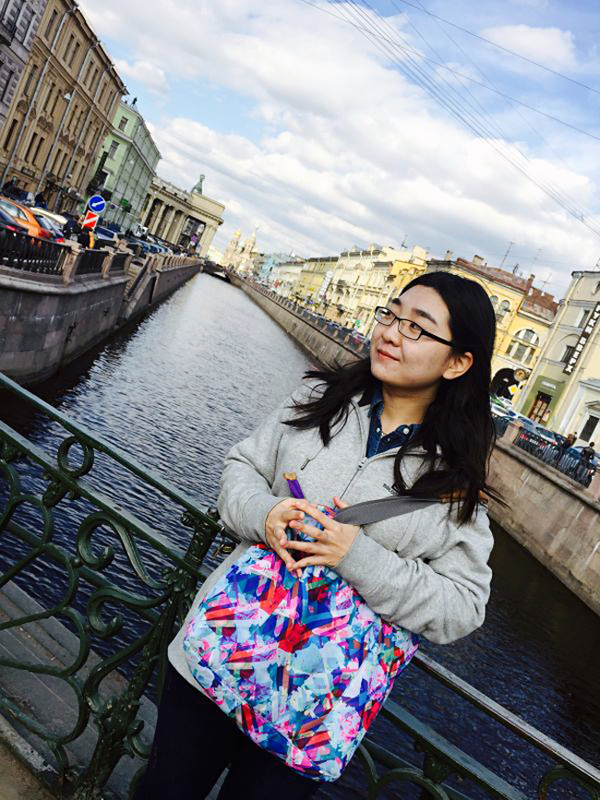 Ri Guang studied Russian in the Liaoning province in China and decided to get a master’s degree from the Philological Department of St. Petersburg State University. In Chinese, the young woman’s name means sunlight, so she has naturally chosen Sveta as her Russian name. Why are you studying Russian? I chose Russian as my specialty by accident. It often happens that you are short of points to enter the course you chose originally and you have to adjust your plans. In fact, I wanted to study French. However, during the course of my studies I realized that Russian is very interesting and it also helps in learning other languages, like French for example. Russian is a very difficult language and this is what draws people in. Russian textbooks in China are very funny. They have many obsolete expressions and notions that date back to Soviet times. You often see phrases like “Comrade! Where are you going?” in them. Even students, who are just starting to learn the language, realize how ridiculous it sounds today. What are your favorite places in St. Petersburg? So far, I have not had much luck with sightseeing. I liked the park in Pushkin, but when I went there it was snowing and the Catherine Palace was closed. I should have checked their working hours more attentively before going… As it was, the weather was not really conducive for a walk in the park and I could not see the interiors of the famous Russian palace. So I left. St. Petersburg. Source: Personal archive. I am also waiting for good weather to settle in to take a walk in the Victory Park: I like it the park. There is a library nearby. I have not been in St. Petersburg for long, so I have not seen the summer yet. I guess that park is far more pleasant in the summer. Generally speaking, I am not very fond of St. Petersburg’s weather. It is cold here and it often rains. There is little rain in the part of China where I am from. In that sense, I like Moscow better: it is warmer and sunnier there, even when it is not summer. Having said that, I had a great visit to the Hermitage. It was wonderful to see paintings that I had only seen in books before – by Rembrandt, Da Vinci and Gauguin. I also wanted to visit the Oriental art rooms but I could not find them. It is such an enormous museum that you can easily lose your way there. Do you like the food in the city? I think Chinese food is tastier. I find Russian food too bland so that I always add more salt and pepper. Having said that, I eat practically everything that is available at the canteen without any problems. All the more so since I don’t cook so I have to go there pretty often. But I am very fond of cottage cheese bake: it is sweet and more like pudding. You don’t need to add anything to it. And borscht. I was lucky to taste real borscht prepared by a real Russian babushka. It was delicious! What’s the main difference between life in Russia and China? The main difference between China and Russia is that there are much fewer people here. And the pace of life is different here. I like it very much. Even in the rush hour, when everybody is complaining about large crowds, there are still considerably fewer people than back home. In China, it is hard just to get on a bus, whereas here hardly anybody is left on a bus stop. Furthermore, there are many means of public transport here. I had never seen a trolleybus before I came here and I had seen a tram only once, on a trip to Europe. Also, St. Petersburg has neat streets, with beautiful houses. It is easy to find one’s bearings here. In China, the majority of houses look the same and it is sometimes difficult to find one’s way. As for people, I don’t think they are much different. They interact and behave in public in the same way. Although, perhaps, I haven’t had much time to observe them yet. At the same time, I was very surprised that young men here can walk up to a girl in the street and start chatting with her. It is so strange. In China, a young man like that would be seen as a hooligan. Also, I noticed that birds in Russia are often not afraid of people. That is unusual. In China, birds take flight instantly. Because anything that flies can become food in China! Also, you’ve got very cheap cosmetics, very cheap. There is not much one can say about it but I think this is the first thing that I would tell about Russia back home.